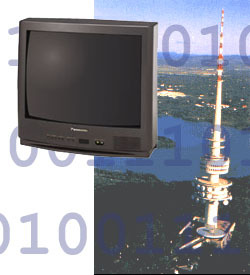 This site contains an introduction to Digital Television in Australia. Digital Television is carried over three main mediums - Terrestrial (the VHF and UHF signals most people are familar with), Cable and Satellite. Much of this site focusses on free to air terrestrial services including HD, which these days are sometimes promotionally referred to as Freeview. February 2018: Most of the information presently on this site is still accurate, although written from a 2001 perspective - updates are certainly needed to make things clearer and they are on the way.